The finest wide receiver in the history of NFL football, bar none. The incredibly athletic Rice has scored the most touchdowns in NFL history, plus he holds virtually every career record for receptions, yards receiving, all-purpose yards, touchdown receptions and yards from scrimmage, and most consecutive games with at least one catch!! 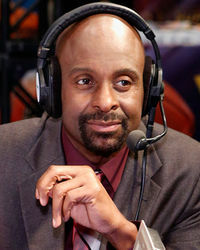 Rice was born October 13, 1962 in Starkville, Mississippi where he attended Mississippi Valley State University and starred on the school football team. 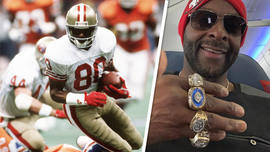 Rice was drafted by the San Francisco 49ers in 1985, and after an initially sluggish start, he became one of the cornerstone's of the SF 49ers team and played in several winning Super Bowl's, pairing brilliantly with legendary San Francisco 49er quarterback's Joe Montana and Steve Young. After fifteen years with the San Francisco 49ers, Rice was traded to the Oakland Raiders, and even at 39 years of age he was still capable of setting records and out running opposition players. After three years with the Raiders, Rice was traded to the Seattle Seahawks in 2004, however after only one season with Seattle, Rice was released at his own request, and in 2005, he signed a one year deal with the Denver Broncos. Rice has been awarded Pro Bowl status on 13 occasions, and was Super Bowl MVP at Super Bowl XXIII. Jerry Rice Is Insane ... Eli's A Hall Of Famer! NFL Star Busts Out Stripper Moves!